Do you remember Global TV's Train 48, which took place on a GO Train car carrying average denizens home from Toronto to Burlington every evening? After ambitiously setting off in 2003 to reform the hoary format of television soap operas, Train 48 also experimented with the burgeoning techno interaction between viewers and their stories, but most importantly addressed the still pressing need for inexpensive, compelling local content. By the summer of 2005, the whole enterprise de-railed. 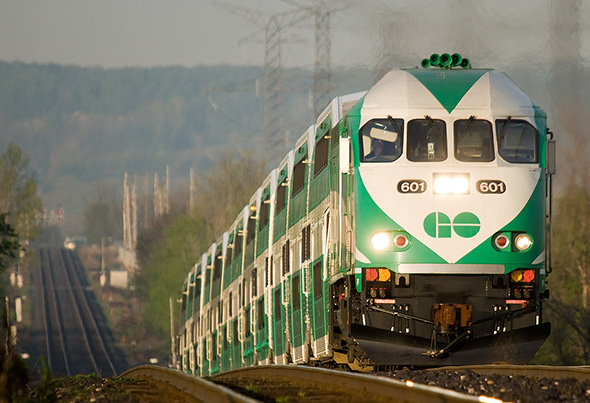 Anyone who commutes daily on GO Transit knows about Train families - those groups of 2-4 people who sit together morning and night, gossiping loudly about their mundane lives, the weather, their idiot bosses, current events, did you see that on TV last night? Blah, blah, etc., etc. Spending ludicrous amounts of time huddled together in transit hell with strangers forges unlikely bonds, so it's not all that surprising these mostly annoying archetypes might yield dramatis personae for a soap opera. Australia got there first with Going Home (2000), a shot-on-the-same-day-as-aired soap detailing a shared public transit commute between a cast of local characters, with loosely improvised storylines based upon suggestions made by viewers on the show's interactive website. While in Australia participating in a debate about the importance of lucrative international co-productions to compete with moneyed American TV hegemony, Toronto based producer Steve Levitan optioned the rights for Going Home on the spot. Its creator had offered up a compelling argument that cheap local content married to audience interaction could be just as compelling and competitive as bigger budgeted U.S fare. "I instantly became very excited about the production model. I still think it is the way of the future" muses Levitan. 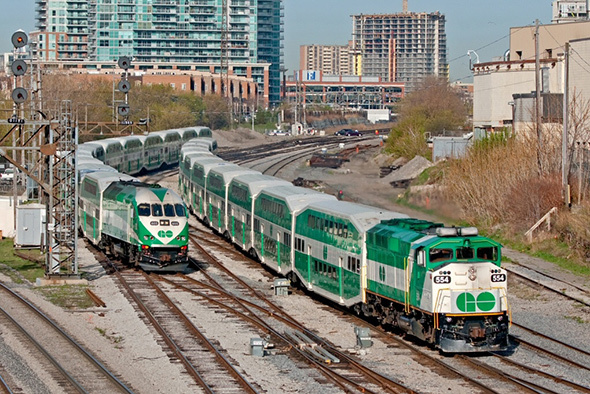 Originally Train 48 was to be set on a VIA train (Train 48 is actually the designated Toronto to Ottawa train which leaves every morning at 9AM), however at the time VIA was sponsoring the CFL and rather narrowly saw little value in a daily 30-minute commercial. While GO did not actively sponsor the show, it allowed the crew to salvage any materials they needed from the GO graveyard for the 64-foot replica carriage on which Train 48 was filmed. Focusing on 12 or so GO commuters, Train 48 took its cues from British "kitchen-sink" soaps more than glossy American dailies (Coronation Street has been a CBC fixture for almost 50 years and its warts and all realism is certainly more "Canadian" than the assorted waxworks of Genoa City), specifically its improvisation techniques a la Mike Leigh. Scripts were written very loosely, then beefed up through actor input and improv - shot by 1:30pm, edited by 5:00pm and ready to air by 7:00pm - allowing for timely real life events to be incorporated. Many wrongly recall Train 48 as being driven by headline news such as the Iraq war, SARs and Transgender issues, but mostly the material served as window dressing for defining the characters. Heading up the cast was Lisa Merchant, a veteran of the Second City improve comedy scene, who remembers spending the weeks leading up to filming at workshops honing character development "so that when we got there it wasn't stiff, it was like we knew each other well by that point". In fact, many cast members were from the Canadian sketch comedy/improve world, signposting the series was meant to be as comedic as it was a dramatic. Actors like Paul Braunstein, Joe Dinicol, Krista Sutton, Amy Price Francis, Ingrid Hart, Paul Sun-Hyung Lee and Andrew Martin looked like the kind of people you see on the GO train every day. Memorable cameos included John Neville, Pinball Clemons, and Sheila Copps. The heady innovation came in the form of audience interaction. Levitan recalls a (then novel) time when Global TV wanted Train 48 to drive traffic to their blooming website Canada.com, "so we did an experiment where we had Pete the Stockbroker (Raoul Bhaneja), on fear of getting his knees broken, on the phone with his bookie betting on the outcome of the Jays/Yankees game that started at 7:30pm, right when our show finished. We invited the audience to go to the site and vote for who they thought would win, and it ended up freezing Canada.com for a few days." In addition to involving the audience in storyline and character evolution on the Train 48 forums (now long gone) at Canada.com, Train 48's greatest magic trick may well have been its cost effective Henry Ford-ian assembly line ethos. Coming in at around $40,000 per episode, Train 48 routinely got around 200,000 - 300,000 viewers per night. Contrast that with expensive current CBC series such as Strange Empire and The Honourable Woman, which receive roughly the same viewership but come with a price tag of $1.5 million a show. Consider the current climate where conventional TV networks scramble to stop the migration to Netflix and numerous online options: other than live sporting events, or big ticket reality series, most series are no longer "sticky," and can be viewed wherever and whenever. A series in the mold of Train 48 can be current, custom made by the viewers as every episode became a focus group on what they want to see, which characters need to go, and how conflicts might be resolved. It was the closest television ever got to the insanely popular Choose Your Own Adventure books on which the most prized target demo had grown up on. Train 48 also existed in a time before social media exploded, as Levitan laments "Perhaps the train left the station a little too early". Can you imagine such a robust format with built in viewer interactions via Twitter, Facebook, Instagram and YouTube? It seems bizarre that such a show has yet to emerge, although Levitan boils it down to the fear broadcasters have in giving up the amount of real estate a daily soap requires. Entertainment Tonight Canada (which ultimately replaced Train 48 in 2005), E Talk and Seinfeld reruns are a much safer, albeit more expensive bet. Levitan has ruled out a return engagement set on a train, but still has several series in development which adhere to the Train 48 format. He hopes that one day a Canadian broadcaster will see value in re-running the entire Train 48 series, if only to comply with stringent Cancon quotas. While Lisa Merchant still gets approached by people on the street who remember her from Train 48 ("Hey, you were on the train!" is their most frequent observation), the online legacy of the series is strangely low-key. Aside from a few clips on YouTube, the music video for the theme song by 9 Point Landing ("Train Goes") and a full episode courtesy of Steve Levitan's Protocol Entertainment channel on Vimeo, you would be hard pressed to know it ever existed. Weirder even when you consider its grassroots internet pedigree and the fact that it was only a mere decade ago. After 318 x 30 minutes episodes, Train 48 pulled into the station and allowed viewers a sight which before then had been unseen - the riders disembarking - victims of changing priorities and leadership at Global, and a TV landscape which was about to experience a seismic shift due to social media's rising crust. When riding GO transit in 2014, it's a lot easier to tune out the mostly vapid Train families with the aid of mobiles, or simply retreat to aural comfort in the Quiet Zone. But for a brief time in the mid-2000s, Train 48 brought them into our homes every night and showed that it is possible to creative innovative TV series, cheaply and with a uniquely local bent.